Product is not available to Unregistered Users. If you wish, you can register here. SmilSignage Vending Touch24 is an automated retail shop for Electronic Devices always open that can sell different products of different shapes and dimensions, 24/7. It is the ideal solution to get the best out of the overtime of the standard shops to increase sales and to give a non-stop service to the clientele. 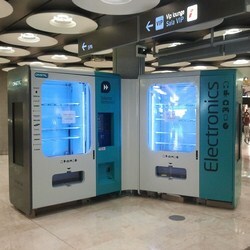 The biggest of its range, a real automated retail store always open. You can create an automated retail shop, indoor or outdoor, without the need of any employees. The no spiral system storage, with removable sides and no fixed rows. The best solution to sell products of any different size and packaging. The combination of these features with the voice guide, the big color monitor and the top level software for the most efficient automated retail service. The system with the real-time remote connectivity to monitoring a network of SmilSignage Vending. The banknote reader, the coin acceptor change giver, the interactive voice guide system, the big color monitor and the most advanced managing software guarantee easiness and autonomy in the purchasing for everybody. Can be placed either in the window than outside because it is equipped with vandalism proof structure with secure locks, intrusion proof sidebar, payment systems separated from the storage area, cashless payment system, vandalism proof window with UV filter and pick up box secure lock. The graphic color touch monitor combined with the top-level software interacts with the client and displays the phases of the purchase, from the choice to the pickup of the product. Big and very clear for the highest easiness for everybody. The integration with a Digital Signage System, is the industry’s first to provide vivid video playback with dedicated hardware-based High Definition (HD) 1080p video decoding, capable of rendering dynamic information using HTML5 technology, and be manageable from leading software solutions via SMIL. Digital SMIL-Board combines the popular catering board with a 15" screen with integrated SMIL player and Software, in a pre-configured package for immediate use. Refrigerator with 32" digital display in the door. With Media Payer buil in for contents displaying. Optional WiFi module. Refrigerator with 39" digital display in the door. With Media Payer buil in for contents displaying. Optional WiFi module. Mini Tablet solution for digital price tagging and perfect to display the specifications for some consumer electronics.